The ratio of these two amounts. This Thoughtful Disclosure Alert summarizes our findings based on a review of the proxy statements filed since the beginning of the year by representative companies in the technology sector headquartered throughout the United States. We call this group, which consists of many of the most prominent companies in the computer/hardware, internet/software, and semiconductor sectors, the “Tech 150.” As of May 10, 2018, 79 of the companies in the Tech 150 (54.0%) had filed either a definitive or a preliminary proxy statement containing the CEO pay ratio disclosure. Our review has determined the median pay ratio among the companies that have made their initial disclosure to be 54 to 1. 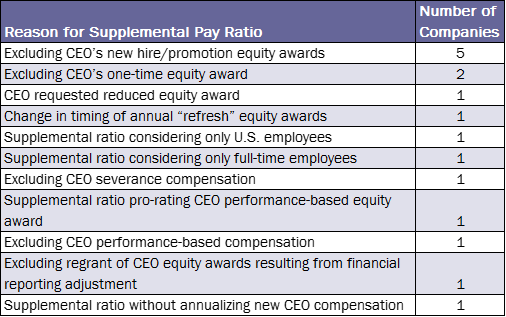 So far, the CEO pay ratio distribution is highly concentrated below 100 to 1, with 60 of the reviewed companies (74.1%) disclosing pay ratios lower than 100 to 1. Similarly, of the 19 companies disclosing pay ratios 100 to 1 or greater, only six companies reported ratios above 200 to 1. Certain prominent technology company CEOs (often founders) are well known for taking little or no compensation for serving in that role. Four companies, Square, Inc., Shutterstock, Inc., Twitter, Inc. and Instructure, Inc., have disclosed pay ratios of 0, as their respective CEOs did not receive compensation for serving as chief executive officer in 2017. 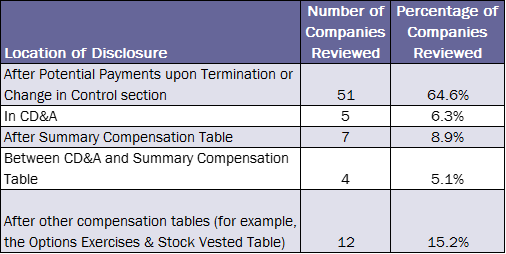 Our review also determined the annual total compensation of the median employee among the companies that have made their initial disclosure to be $108,209, with annual total compensation ranging from $7,782 to $256,370. 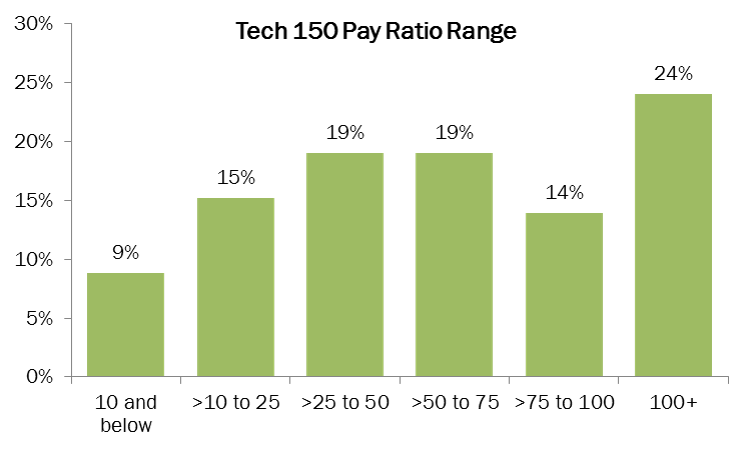 For purposes of identifying the median employee, the CEO pay ratio rule permits companies to use one or more compensation measures, as long as such measures are consistently applied across the employee population. Our review indicates that companies took full advantage in the flexibility of the rule to develop a methodology for identifying their median employee that reflected their individual situation. 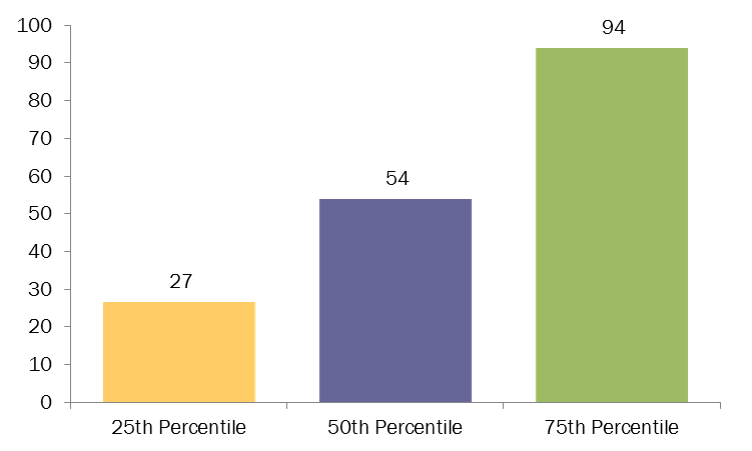 Reflecting the prevalence of equity awards in the technology sector, we found that total direct compensation (total cash plus equity awards) was the most popular compensation measure, employed by 44 companies (55.7%). This contrasts with other industry sectors, where broad-based equity compensation programs are less common. Where equity awards are included in the compensation measure, most companies are using the grant date fair value of the award (rather than the value of the portion vesting during the year) as the amount of this pay element. All of the companies reviewed have disclosed that they used a full employee census file to determine the median employee (subject to the application of the de minimis exemption in a few instances as noted below). 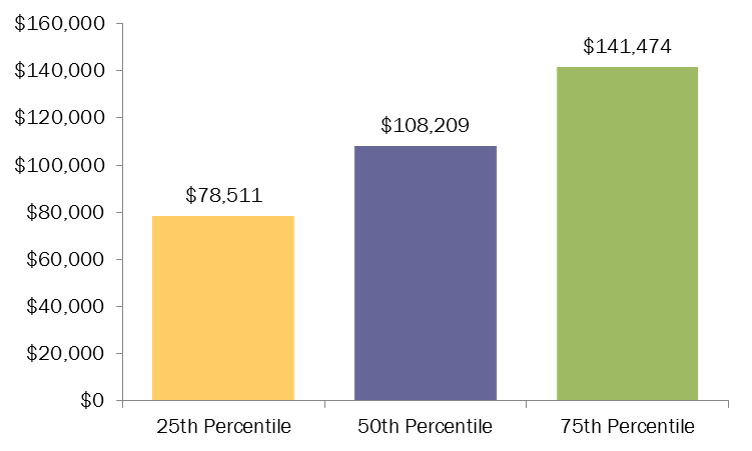 To date, no company has indicated that it used statistical sampling to identify its median employee. While the CEO pay ratio rule permits companies to exclude non-U.S. employees from their employee population where a country’s data privacy laws prevent the procurement or processing of the relevant compensation data, to date none of the reviewed companies have disclosed their use of this exemption. In addition, the CEO pay ratio rule contains a “de minimis” exemption, which permits the exclusion of non-U.S. employees, on an all-or-nothing basis, from one or more countries that, in the aggregate, account for 5% or less of a company’s total employee population. To date, 20 companies (25.3%) have indicated their use of the de minimis exemption when determining the employee population from which they identified their median employee. While it may be premature to draw any conclusions, this outcome is likely a reflection of the relative ease with which technology companies can access compensation data for their global workforce. While a sizable number of companies in the Tech 150 have yet to file their 2018 proxy statements, certain patterns are beginning to take shape. Most notably, the pay ratios being disclosed are not as large as expected. As illustrated above, the majority of the pay ratios are well below 100 to 1. On the other hand, median employee compensation is trending higher than in many other industry sectors, perhaps a reflection of the highly-educated workforce needed to power technology companies as well as the broader distribution of equity awards. Finally, as envisioned by the CEO pay ratio rule itself, companies appear to have taken a pragmatic approach to undertaking the most complex – and potentially expensive – aspect of compliance: the identification of the median employee. By tailoring their compliance methodology to their specific facts and circumstances, it appears that most companies have been able to complete this disclosure exercise without encountering undue difficulties. As the year continues, we will see whether these trends hold firm. Compensia has extensive experience in helping companies develop an appropriate methodology for identifying their median employee, as well draft the required disclosure that must accompany their CEO pay ratio. If you would like assistance in preparing your CEO pay ratio disclosure, or if you have any questions on the subjects addressed in this Thoughtful Disclosure Alert, please feel free to contact Mark A. Borges or Christine McGrory.